The Association of Southeast Asian Nations (ASEAN)1 was Hong Kong's second2 largest trading partner in merchandise trade in 2018 and the fourth largest in services trade in 2017. Total merchandise trade between Hong Kong and ASEAN amounted to HK$1,070 billion in 2018 and total services trade between the two sides was HK$127 billion in 2017. As at end 2017, ASEAN ranked fourth among Hong Kong's destinations of outward direct investment, with a stock of HK$435 billion. It ranked sixth among Hong Kong's sources of inward direct investment, with a stock of HK$628 billion. 1 ASEAN comprises Brunei Darussalam, Cambodia, Indonesia, Laos, Malaysia, Myanmar, the Philippines, Singapore, Thailand and Viet Nam. 2 Both ASEAN and the European Union are counted as single entities in the rankings in this paragraph. Hong Kong and ASEAN commenced negotiations of a Free Trade Agreement (FTA) and an Investment Agreement (the Agreements) in July 2014. 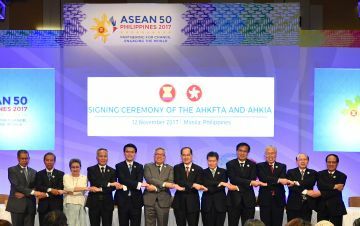 After ten rounds of negotiations, Hong Kong and ASEAN announced the conclusion of the negotiations in September 2017; and forged the Agreements on 12 November 2017. The Agreements are comprehensive in scope, encompassing trade in goods, trade in services, investment, economic and technical co-operation, dispute settlement mechanism and other related areas. The Agreements will bring legal certainty, better market access and fair and equitable treatment in trade and investment, thus creating new business opportunities and further enhancing trade and investment flows between Hong Kong and ASEAN. The Agreements will also extend Hong Kong's FTA and Investment Agreement network to cover all major economies in Southeast Asia. They are expected to enter into force after completion of the required procedures by relevant parties. The FTA (consisting of 14 chapters) and the Investment Agreement cover many areas of importance to Hong Kong and ASEAN. Key features are summarised below. The ASEAN Member States (AMS) have agreed to eliminate/reduce their customs duties on goods originating from Hong Kong. Tariff reduction commitments of each AMS and Hong Kong are set out in the Schedules of Tariff Commitments at Annex 2-1 of the FTA. Cambodia, Laos and Myanmar will eliminate customs duties of about 65% of their tariff lines within 15 years and reduce customs duties of about another 20% of their tariff lines within 20 years. AMS' tariff reduction commitments cover different kinds of commodities, including jewellery, articles of apparel and clothing accessories, watches and clocks, toys, etc. Details of tariff reduction commitments of each AMS in specific industry can be found in Trade in Goods: Tariff Reduction Commitments by Commodity. Hong Kong commits to granting tariff free access to all products originating from AMS when the FTA takes effect. Hong Kong exporters who comply with the relevant preferential origin rules and fulfil the relevant requirements set out in Chapter 3 (Rules of Origin) of the FTA can benefit from the preferential tariff treatment for exports to AMS. Hong Kong exporters can claim preferential tariff treatment from AMS by applying for a certificate of origin (CO). The CO shall be issued by the Trade and Industry Department or by a Government Approved Certification Organisation (GACO) of Hong Kong. Trade and Industry Department will issue trade circulars to announce the arrangements and application procedures for such COs before the FTA enters into force. Imports from AMS are not required to be accompanied by a CO in order for the goods to enjoy the tariff-free treatment. Chapter 4 (Customs Procedures and Trade Facilitation) of the FTA promotes mutual co-operation in the administration of custom matters. It seeks to ensure that the customs procedures and practices applying to goods traded between Hong Kong and ASEAN are predictable, consistent, transparent and trade facilitating. Hong Kong and ASEAN will strengthen co-operation in sanitary and phytosanitary measures3 and technical barriers to trade4. Hong Kong and ASEAN affirm their rights and obligations on trade remedies under the relevant World Trade Organization (WTO) Agreements. 3 Sanitary and phytosanitary measures are any measures applied (a) to protect human or animal life or health from risks arising from additives, contaminants, toxins or disease-causing organisms in their food; (b) to protect human life or health from plant- or animal-carried diseases or pests; (c) to protect animal or plant life or health from pests, diseases, disease-carrying organisms or disease-causing organisms; and (d) to prevent or limit other damage from the entry, establishment or spread of pests. 4 Technical barriers to trade include technical regulations, standards and conformity assessment procedures that may directly or indirectly affect trade in goods. 5 Trade remedy measures refer to anti-dumping, countervailing and safeguard measures. Imposition of these measures by the importing economy could result in additional duties (being one of the usual forms) on top of tariffs and other charges or other import restrictions on certain imports. The FTA, covering a comprehensive range of service sectors, will provide better business opportunities and legal certainty in market access for services and service providers of Hong Kong and AMS. business visitors, intra-corporate transferees, contractual services suppliers and independent specialists/experts/professionals of Hong Kong will be granted temporary entry into relevant AMS in accordance with the commitments of individual AMS. Similarly, business visitors and intra-corporate transferees of AMS will be granted temporary entry into Hong Kong. AMS' commitments encompass sectors where Hong Kong has strengths for further development, such as professional services, business services, telecommunications services, construction and related engineering services, educational services, financial services, tourism and travel related services, transport services and arbitration services. Commitments of AMS can be found in their Schedules of Specific Commitments and they are also extracted and set out in the by-sector summary tables. Hong Kong also makes commitments to AMS on a wide range of service sectors. The FTA includes other general obligations to facilitate trade in services. There are rules under the FTA which require all parties to maintain transparent and fair domestic regulations. The FTA also provides a regular review mechanism which paves the way for future negotiations of improvements to market access commitments and progressive liberalisation. In addition to the FTA, Hong Kong and ASEAN have signed an Investment Agreement. The Investment Agreement complements the FTA, in particular its chapter on Trade in Services, which contains provisions on, among others, the treatment of investments in services sectors. permit free transfer of investments and returns. Under the Investment Agreement, Hong Kong and ASEAN have also agreed on a Work Programme to further discuss a few issues, including the mechanism for settling investment disputes between an investor and the host party. The Investment Agreement is an important tool to further strengthen the already strong investment ties between Hong Kong and AMS. With the protection and guarantees it provides, the Investment Agreement should further enhance investors' confidence and boost investment flows between Hong Kong and AMS, benefiting both sides' economies. The FTA comprises a chapter on economic and technical co-operation (ECOTECH) which aims to enhance the benefits of the FTA through capacity building programmes and technical assistance. The ECOTECH Chapter of the FTA will be implemented through an ECOTECH Work Programme. Both sides have agreed to conduct ECOTECH activities in five priority areas, namely customs co-operation, professional services, small and medium enterprises co-operation, trade facilitation/logistics, and e-commerce co-operation. Apart from reaffirming the rights and obligations under the WTO Agreement on Trade-Related Aspects of Intellectual Property Rights, both sides have also agreed to promote and strengthen co-operation in the area of intellectual property rights in order to enhance their economic and trade relations. The two sides have agreed to establish a transparent mechanism for consultations and settlement of possible disputes. An arbitral tribunal may be established if the consultations fail to resolve the disputes.